This is not say the dollar's recent decline was purely technical, but that--squaring of positions not a change in fundamental views--seemed like the main driver. The dollar's slide began after new highs were recorded on December 8. Since then the implied yield of the December 2015 Eurodollar futures fell by more than 20 bp. The implied yield on the December 2015 Fed funds futures contract fell 18 bp. We think this reflects ideas the disinflation impulse from the first and secondary impact of the drop in energy prices will limit Fed's hikes next year. The FOMC meeting today is the main focus. The US November CPI figures to be released earlier are of little consequence, though for the record the headline is likely to ease (from 1.7% to 1.4% with downside risks, while the core is sticky (unchanged at 1.8%. 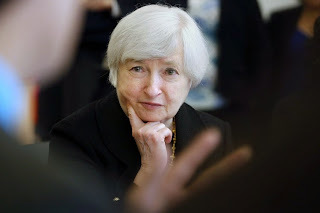 Within the FOMC statement the key interest is in how the Fed modifies the statement relating to interest rates remaining low for a considerable time after the asset purchases are complete. The asset purchases are over. The statement will change. Some expect the entire phrase to be eliminated. We suspect that it will be replaced with something focusing the market's attention on economic data. We expect that the recent retail sales, including auto sales and the industrial output figures following the strong employment data will spur the Fed to upgrade its economic assessment. How the statement characterizes inflation and the downside risks posed by the decline in energy prices will also come under scrutiny. As Fischer and Dudley have already hinted, we expect the FOMC to look past the short-term impact and focus on the stimulus side. It is not simply that consumers spend shift spending from gasoline to something else, but rather that something else is likely, based on consumption patterns, to have a greater multiplier effect for the domestic economy. There has been some talk that market volatility may force the Fed to slow down the preparation for the normalization of monetary policy. We suspect too much is being made of the volatility. In October, some, including a regional Fed president, spurred such thinking. The minutes suggest that the FOMC considered commenting on the volatility, but decided against. We see no compelling reason for the Fed to change its collective mind now. In our understanding of how the Fed operates, we think the statement is the most important communication tool. The Fed's forecasts (dot-plot) are too noisy to get anything but broad brush strokes. Unemployment and inflation forecasts will likely be trimmed. We expect the long-term Fed funds forecast, which we assume is the long-run equilibrium level will also be shaved. There are a few other developments today to note. First, oil prices are about 1% lower. The API figures showed a build rather than a draw down. Kuwait estimates that the surplus now is around 2 mln barrels. There is more talk of Brent falling below $50 a barrel. Second, Japan's trade deficit was smaller than expected, but this reflected a surprise fall in imports. Exports were also weaker than expected. The November trade deficit stood at JPY892 bln. This was about JPY100 bln smaller than expected. Exports rose 4.9% year-over-year. The market had anticipated a slowing to 7.0% from 9.6% in October. The lackluster Japanese exports may help explain why there has not been as much of a push back against the depreciation as the cries of currency wars have suggested. Japanese imports fell 1.7% from a year ago, following an upward revision to 3.1% in October from 2.7%. This could be reflecting the decline in oil prices. Third, the UK reported both the MPC minutes and the latest labor figures. The minutes showed the same 7-2 vote. Although the meeting was held before the recent soft CPI figures, we don't expect the hawks changed. Indeed the rise in the average weekly earnings (Oct) from 1.0% to 1.4%. Excluding bonus payments, earnings rose 1.6%, may spur another convert to the hawk side next year. The claimant count fell 27k after a revised 25k decline in Oct (from 20.4k). Fourth, the first round of the Greek presidential selection process is being held today. The results should be out around 17:30 GMT (12:30 pm ET). There is little chance that the government will deliver the 200 votes needed to confirm Dimas. The importance of this round is to see Samaras' progress. This coalition has 155 seats. He needs 180 by December 29 for the third and final round. Picking up less than 10 seats would be disappointing. Picking up more than 15 would be exceptional. We suspect the risks are asymmetrical to the downside. That said, recent polls show that Syriza's lead in the polls has narrowed and is within a statistical draw.